30 May 2013 – Fast just got faster with the next-generation EVGA GeForce GTX 770, a high-performance graphics card designed from the ground up to deliver high-speed, super-smooth gaming. This series will also use EVGA’s award winning cooler: the EVGA ACX Cooler. This double ball bearing design redefines traditional enthusiast coolers. Starting with a 40% increase in heatsink volume, the EVGA ACX is more efficient at dissipating heat, allowing for 15% lower GPU temperatures. A reinforcement baseplate maintains a straight PCB, and helps lower mosfet temperatures by 7% and memory temperatures by 15%. EVGA also spent time to ensure that even the fan blades were of the highest quality; with a 700% increase in strength, and 25% lower weight when compared to competitors’ dual fan designs. This makes the fans 20% more efficient by requiring lower power levels. Of course, EVGA is also using double ball bearing fans which offer a 12 year lifespan; this is 4X longer when compared to competitors! NVIDIA GPU Boost 2.0 – Dynamically maximises clock speeds to push performance to new levels and bring out the best in every game. Boost 2.0 allows complete control over Temperature Target and Power Target, allowing a new way to customise your overclock. Also, with the new EVGA Precision X, you can increase the voltage for maximum overclock! NVIDIA FXAA – Anti-aliasing smoothes out jagged edges but can be demanding on framerates. FXAA is a new anti-aliasing technology that produces beautiful smooth lines with minimal performance impact. And with Kepler based GPUs, you'll be able to enable FXAA in hundreds of game titles through the NVIDIA Control Panel. NVIDIA Adaptive Vertical Sync – Nothing is more distracting than framerate stuttering and screen tearing. The first tends to occur when framerates are low, the second when framerates are high. Adaptive V-Sync is a smarter way to render frames. At high framerates, V-sync is enabled to eliminate tearing, at low frame rates, it's disabled to minimise stuttering. It gets rid of distractions so you can get on with gaming. NVIDIA 3D Vision Surround – Imagine expanding your gaming real estate across three displays in full HD 3D for a completely immersive gaming experience. With the EVGA GeForce® GTX 770, you can also use award-winning NVIDIA 3D Vision® technology to build the world's first multi-display 3D gaming experience on your PC. Additionally, the GeForce GTX 770 supports an accessory display for the ultimate gaming experience! PCI Express 3.0 – Offers double the bandwidth of PCI Express 2.0, for the highest data transfer speeds to allow for maximum performance in bandwidth-hungry games and 3D applications. The GTX 770 is still backwards compatible with all existing PCI Express motherboards. 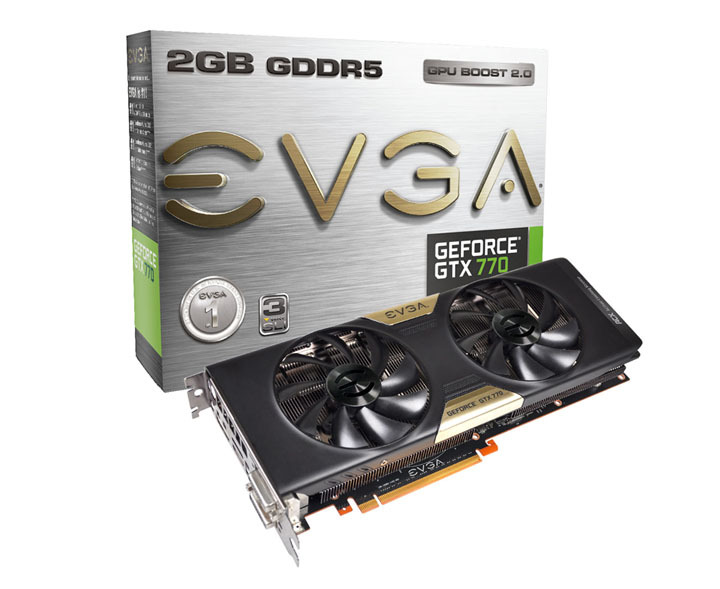 Learn more about the EVGA GeForce GTX 770 here. Find out about the EVGA ACX Cooler here.